*Editor’s Note: Some links in this article contain graphic content. 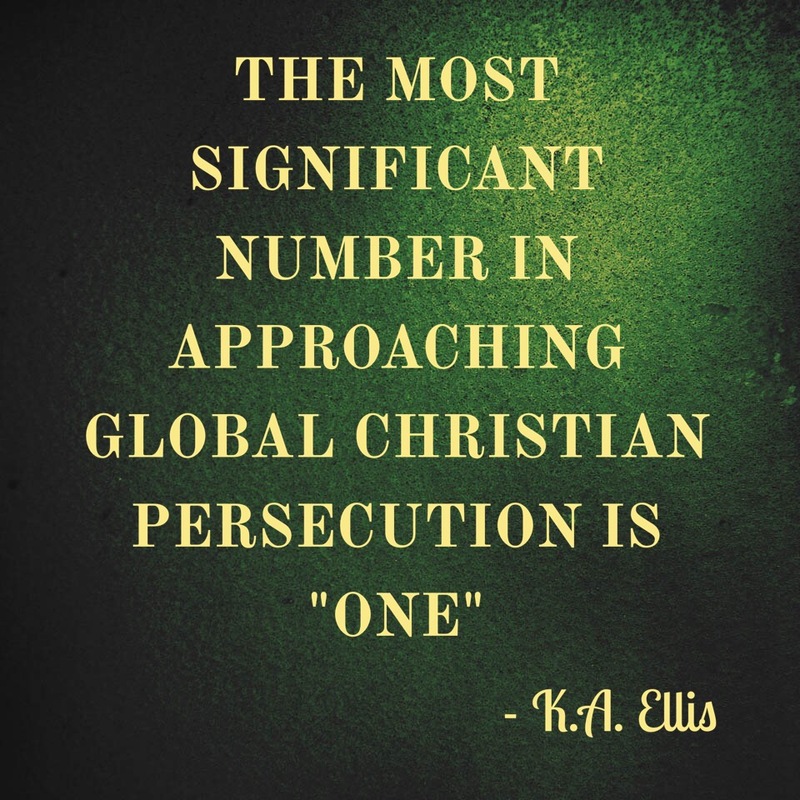 I’m often asked why I prioritize the global persecuted church when there’s so much need right in our own backyard. I understand the question. Like most, I serve a local community with pressing needs and issues. How should we regard the global persecution of Christians alongside our local pressing social, cultural, doctrinal and personal matters? First, let’s crunch some numbers. 30 – the assumed number of Ethiopian Christians killed in Libya on a video released yesterday by ISIS. 371 – the number of days (as of this writing) since 250+ schoolgirls in Chibok, Nigeria were kidnapped by the insurgent group Boko Haram, most of whom were from Christian families. The one-year anniversary passed last week. 148 – the number massacred by Al Shabaab in a fifteen-hour siege on Garissa University, a predominately Christian college in Kenya; an additional 104 were injured. 21 – the number of Copts publicly beheaded by ISIS, many of whom cried out to Jesus with their final breath. Numbers tend to draw media attention. The media however rarely discuss the numerous Christian populations who suffer systemic discrimination, economic pressure, cultural oppression, forced exile, reputational ruin, international human rights violations and the like due to their Christian faith. We have seen rampant church bombings escalating into the thousands. By some estimates, the number of Christian refugees forcibly removed from their homes in Southeast Asian, African, and Middle Eastern countries is now inching toward seven-digit territory. As a result, the international community is no longer denying that anti-Christian sentiment is a growing worldwide phenomenon. Each number we hear about represents a life with a story. Each number also represents rising degrees in the thermometer of global hostility toward people of the Christian faith, whether one’s faith be merely nominal or genuine. For us, “one” is no mere number or statistic; it is a state of being. We are one because Christ has determined that we should be so. On the eve of Christ’s greatest trial, we find him offering his heavenly Father a three-fold prayer for himself, his disciples, and for future generations of believers who will bear his name. This prayer in John 17 offers three striking clues to the significance of “one.” First, after cautioning his disciples in the preceding chapters that the world would hate them as it has hated him, Christ’s prayer is framed by reflection on the enmity between him and the dark force at work against him set in motion in the first garden. He further frames his prayer with his victory over that force, and the shared enmity and victory his disciples and followers will likewise experience through their union with him. The second observation is more broad. There are no other temporal relationships, either on earth or in relation to God the Father, that are based on physical and spiritual union with the entire Person of Christ. Because Adam fell in the flesh and severed humanity’s relationship with the Father, humanity lives under that curse in the flesh likewise alienated. In the fullness of Christ’s human flesh and the fullness of his divine holiness, he bridges the chasm between Adam and the Father. His full humanity and full divinity makes this bridge not only possible, it makes it intimate. The apostle Paul elaborates on Christ as our flesh and Spirit bridge, writing that while we were once dead in Adam, we are now made alive in Christ. Finally, we can observe that though our other earthly relationships and concerns may have temporal significance, they are not Christ’s primary focus at this hour. Christ’s prayer for unity and endurance is formed, uttered, and accomplished at the greatest hour of trial in all of redemptive history. At this critical juncture there is one relationship on his mind, and it is ours. In our unity with Christ we have a relationship that is intimate, Christ-centered, physical, and distinct. No other earthly relationship is bound up in our union with Christ. While we know that in his presence nations tribes and tongues will be recognizable and harmonized, this particular prayer does not distinguish us in terms of these categories. Therefore, while our unity in Christ’s body does not necessarily cancel out our ethnic, tribal, or societal associations, or even our familial and blood relations, our union with Christ’s Person carries a strong suggestion of Spirit-wrought uniqueness centered only in him. There simply is no comparison to any other earthly alliances. There is need everywhere. We can (and should) be a prophetic voice regarding cultural and social concerns, whether they take the form of mercy ministry, addressing poverty, justice or right-to-life issues, racial issues, trafficking, immigration, human rights advocacy, traditional marriage, arts, political or cultural influence, and so on. It is our privilege to bring God’s transformative Word to bear in these areas. Yet even as the apostle Paul exhorts us to good works he qualifies the primacy of our unique relationship in Christ: do good to all, “especially those who are of the household of faith.” Making room for pressing social and cultural issues and for the concerns of the persecuted should, at the very least, be a both/and proposition – not one of either/or. In the midst of tragic news about ‘our Body,’ we may also display the redemptive purpose of suffering as the Body of Christ. This is the climax of Christ’s prayer, that the nations may know him and the Godhead be glorified. These light and momentary hardships are preparing us all for even greater things, to the ultimate glory of God. Individual members of our Body may be assaulted in the flesh, but no one can touch the Body in the Spirit that is held together in Christ. For this reason we endure, and do not lose heart. As believers joined literally and spiritually to the whole Person of Christ, we cannot divorce ourselves from other members of Christ’s body anymore than Adam could leave the woman in the first garden – they, too, were one, albeit in a temporal sense. We are a single organism referred to as “Christ’s Body” because Christ has given us his life-giving breath and body to share. In relation to anti-Christian hostility, we cannot remain numb or indifferent to the pain or loss of Christ’s legs, hands and feet which are our own. Regrettably, it is possible that we will see more alarming numbers in the coming days. We may take comfort knowing that as we navigate these days of grisly statistics together, “one” is the only number necessary to stir us to action. Thanks for your talk at CRU15. I have a lot to mull over and pray about. Thanks for checking this out, Michelle. We enjoyed ourselves with the CRU folk – we arrived early last week, so we were ministered to as well. Appreciate you all.